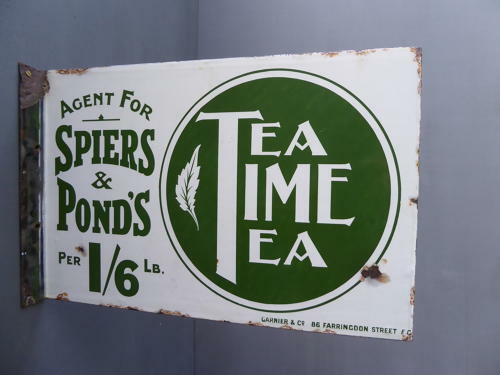 A beautiful early vintage Spier & Ponds Tea enamel advertising sign. A fantastic piece of advertising in amazing condition by Garnier of London. Messers Spier & Ponds were responsible for much of the catering along the major railway lines up & down Great Britain during the early 20th century. This enamel sign is an exceptionally rare surviving example. Wear commensurate with age as pictured, in wonderful condition overall, unrestored.